Tyson is the largest poultry producer in the U.S. and one of the most notorious animal-abusing companies in history. In response to overwhelming consumer demand to end needless torture of chickens, dozens of major food companies—including Subway, Burger King, Starbucks, Compass Group, Aramark, Sodexo, and Chipotle—have committed to improving their animal welfare standards to help prevent needless suffering. Tyson, however, continues to support horrific animal abuse by failing to adopt the same meaningful animal welfare standards. Tell Tyson it’s time to stop torturing chickens! Tell CEO Tom Hayes that Tyson should stop torturing animals and adopt these urgently needed chicken welfare standards! Act now! It made me sick to my stomach seeing hidden-camera video of animals being tortured by Tyson—baby birds crammed by the thousands into giant windowless sheds forced to live in their own waste for weeks without access to fresh air, sunlight, or environmental enrichments. To make matters worse, your company purposely breeds chickens to grow so fast they frequently suffer crippling leg deformities and die from painful heart attacks and organ failure. These are common-sense changes that would alleviate needless animal suffering. As the world’s largest poultry producer, you have both the power and ethical responsibility to prevent horrific cruelty to animals. Visit Tyson Foods on Facebook and tell them to stop torturing chickens. These are commonsense minimal changes that would greatly alleviate needless suffering for billions of birds every year. Chickens raised for Tyson Foods are artificially bred to grow so unnaturally fast they often suffer debilitating leg pain and organ failure. Workers are caught on camera routinely punching, beating, throwing, and tormenting animals for fun. Violently shackled upside down by careless workers, many birds suffer broken bones and other injuries. Improperly shackled chickens miss the “kill blade” and have their heads ripped off while still alive. Multiple undercover investigations by Mercy For Animals into Tyson Foods—the largest poultry producer in the U.S.—have exposed horrific animal cruelty, including birds bred to grow so fast they collapse under their own weight; workers violently punching, beating, and stabbing animals; and birds having their heads ripped off while they are still alive and conscious. Each time our investigators go behind the scenes at a randomly selected Tyson Foods chicken factory farm or slaughterhouse they emerge with horrific images of animal abuse. Hidden cameras captured thousands of chickens suffering from untreated injuries, illnesses, and debilitating leg deformities at this Tyson contract farm. A whistleblower filmed rampant animal abuse while working at this Tyson Foods slaughterhouse—perhaps the largest poultry slaughterhouse in the world. At this contract farm for Tyson Foods—a major McDonald’s McNugget supplier—a brave investigator documented widespread animal abuse and suffering. A whistleblower working at this Tyson Foods contract chicken factory farm documented heart-wrenching cruelty and neglect. As shocking as it is, horrific animal cruelty and neglect is just business as usual at Tyson Foods. There are no federal laws to protect chickens during their lives at factory farms, and most states exclude chickens from anti-cruelty laws. This means Tyson Foods is able to get away with routinely torturing chickens in ways that disgust most people. Let’s face it, without vegetable-based flavoring like Buffalo sauce or crispy breading, chicken meat is bland and boring. So why not just skip the cruelty—not to mention saturated fat and cholesterol—in favor of delicious vegetarian alternatives like these? 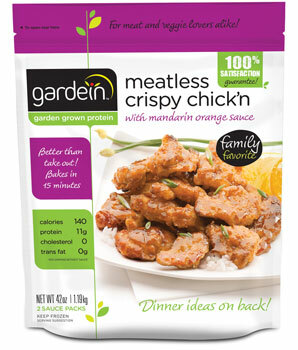 One of the most popular meatless chicken products on the market, Gardein (garden + protein) is perfect for vegans and ardent carnivores alike. 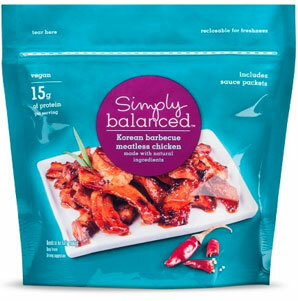 Sold at Target, these savory strips come in Smoky Chipotle, Teriyaki, and Korean Barbecue flavors, making the vegan meal opportunities virtually endless! 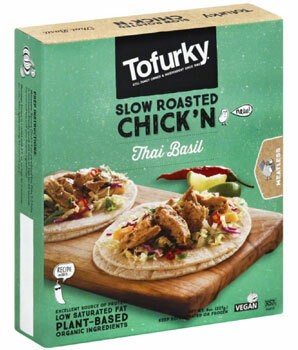 Found in the refrigerated section of your local grocer, this new product from Tofurky comes in several flavors and is super easy to prepare. 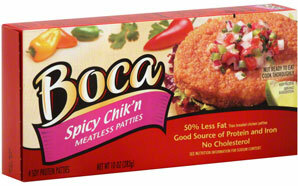 An old standby, Boca offers a large assortment of vegetarian chicken alternatives that come breaded and crispy on the outside but tender and juicy on the inside. Need more ideas? We’ve got you covered. Visit ChooseVeg.com for fun tips, delicious recipes, and more. The best way for individual consumers to help end this cruelty is to leave animals off their plates. Fight Animal Abuse!¡Lucha contra el abuso animal! You can make a difference for animals by joining Mercy For Animals today.Puedes hacer la diferencia para los animales uniéndote a Misericordia Para Los Animales hoy. After our many investigations exposing criminal animal abuse at Tyson, dozens of major food companies have announced comprehensive chicken welfare policies that will ban cruel practices. Tyson, however, has not publicly adopted these same standards and continues to torture billions of birds every year.